However, the primary focus of this article will be how to use the sequelize.js library in conjuction with SQLite, which expands on my prior article A SQLite Tutorial with Node.js. You can find the completed code for this tutorial on my GitHub account. To start off I will initialize a new project using good ole npm init and pressing enter to accept all defaults, except for using the entry point of server.js instead of index.js. As a side note, I am using Node.js version 8.10. Next up I will install the dependencies I will be needing, which are express, body-parser, sequelize, sequelize-cli, sqlite3, and optionally nodemon to keep me from needing to restart Node.js all the time. Inside the new static directory I will make an HTML file named index.html. For building rich and interactive web UI's (or even desktop apps with Electron) I rely on Vue.js for its elegance and simplicity, so again here in this tutorial I will be using Vue.js in the index.html file. Inside index.html I will begin with a simple piece of HTML5 boiler-plate and source Vue.js along with Bulma and Font-Awesome to make things a little prettier, along with axios.js, which I will use for AJAX calls later on. Ok, before I can delve into building out the UI I need to discuss functionality and get to thinking about the different ways in which I will need to pass data back and forth with the backend of this data-driven app. Pretty simple CRUD functionality, right? Furthermore, as I alluded to earlier I will be interacting with the backend via a AJAX REST API, so let me also layout the API endpoints I think I will need. The AddUpdateContact component can be given two props: (1) a title and, (2) in the optional case where it will be used for updating an existing contact a contact object. The data members are initialized based off whether or not the contact object is passed in as a prop or not. The template section contains a form and input fields to either add new contact info or modify an existing one. Then the methods section contains a single save method that emits the information of the contact up to a parent component, which is consistent with the one-way data binding philosophy of Vue.js. The Contact component will receive a contact object as a prop which contains the data to be displayed in its template. The Contact component is also going to utilize the AddUpdateContact component previously described to show the details of the contact, as well as give the user the ability to update it. The update functionality is possible through the use of the event handler method onAddOrUpdateContact that is listening to the save-contact event of the AddUpdateContact component, which then propagates the event up the chain to the main Vue.js instance, which will be discussed shortly. Additionally, there is also a deleteContact method of the Contact component that also propagates the delete message up to the parent Vue.js instance. The root Vue.js object registers the previously described components and defines a set of methods that will interact with the REST API via AJAX calls made to the soon-to-be-built Node.js / Express.js application server. The last part of the UI to take care of is the HTML needed to render the Vue.js components, which is shown below in the entirety of the index.html file. At the top of the file I pull in the Express.js framework via require and then instantiate an app instance. Next I tell the app to use the Express's static middleware to serve up static content (HTML, JS, CSS, et...) from the "static" directory. At the very bottom of the server.js script I tell the app server to bind (listen) to port 3000 and server requests. In order to scaffold out the REST API endpoints previously defined in the table of the previous section I require body-parser and indicate to the express app that it is to be used for parsing HTTP body content. Then I stub out the API endpoints that serve up the requested content. Once the data models and subsequent SQLite database structure is defined I will come back and provide the functionality for the API route callbacks. Sequelize.js is a popular ORM for Node.js version 4 and above that can be used for many different database management systems (DBMS) such as MySQL, Postgres, SQLite, and others. There is a complementary utility library called sequelize-cli that helps to automate some of the mundane as well as somewhat non-trivial parts of database programming. In this tutorial I will be using sequelize-cli to take care of generating the Data Definition Language (DDL) to create database tables, as well as generate data models that create and execute Data Manipulation Language (DML) to query the database, and even a migration system to help with version controlling the database's schema. which will create and use a SQLite database file called database.sqlite3 in the root of the project. In addition to the attributes specified in the model:generate command sequelize-cli will also generate an auto-incremented integer id field as well as as createdAt and updatedAt date-link fields. Note that there is also another table in there named SequelizeMeta. This is the table that Sequelize.js uses to keep tack of the order that migrations are ran in. For example, running this command will show the name of the migration script I just ran. Now that I have the Contact model mapped to a database table I would like to generate a seeder script to pre-populate my database with some data to demonstrate how to interact with the ORM in my application code. Generating a seeder script is very similar to the prior commands. I will edit it as follows to add a few contacts. Lastly, I need to run the seeder to populate the database with these initial contacts. Which gives me output in the console letting me know that the database table was successfully seeded with data. Ok, setup is finally done. Now I can move on to the more fun part of actually interacting with my database-backed Contact model and give those previously stubbed out API endpoints their required functionality. This db variable will contain my Contact model, which is accessible via db.Contact. I start out with the simplest of the API endpoints, the GET /api/contacts endpoint. This endpoint simply needs to have all contacts returned from the database and serialized in a response to the calling requester. I can call the findAll method of the Contact object and once the thenable promise is returned I can fire the contacts off to the client using the familiar res.send(...) provided by the Express.js framework. I can now start up my Express server, point my browser to localhost:3000/index.html, and I will be greeted with my contacts UI. Now if I enter another contact, say, Wonder Woman, but leave the phone number blank (she said she would call me instead of giving her number out), into the UI's "Add Contact" form and press "Save" my contact list will now have four members: Snoop Dog, Scooby Doo, Herbie Husker, and Wonder Woman. Moving on I can now add the functionality to implement the update behavior for the PUT /api/contacts/:id endpoint. This is a two-part interaction from the database programming perspective. First I begin with finding the contact matching the ID given in the API URL using the db.Contact.findById(...) method, then I modify the fields with new data, and end by using the update(...) method of the contact object sending the updated model back down to the database where those changes will be persisted. With this in place I can now update Wonder Woman's phone number because my good buddy Snoop Dog graciously gave it to me. To do this I click on Wonder Woman's name in the contacts list of the UI to expand the details / update form. After filling in her number 111-888-1213 and clicking Save my Wonder Woman contact is updated. The final thing to do is to add the ability to delete a contact via the DELETE /api/contacts/:id endpoint. Deleting is very similar to the update functionality in that the model instance you would like to delete first needs to be retrieved from the database, and then you simply call the destroy() method of the model's instance. Turns out its a good thing that contacts in my contact list can be deleted because Wonder Woman turned out to be a real drama queen and was picking fights with my wife, not cool Wonder Woman. You are about to be deleted. From the UI I can delete Wonder Woman by clicking on the trash can to the right of her name. The entirety of the server.js script is show below for completeness. In this tutorial I have demonstrated how to use the Sequelize.js ORM along with its Sequelize CLI to handle database programming in conjunction with SQLite. 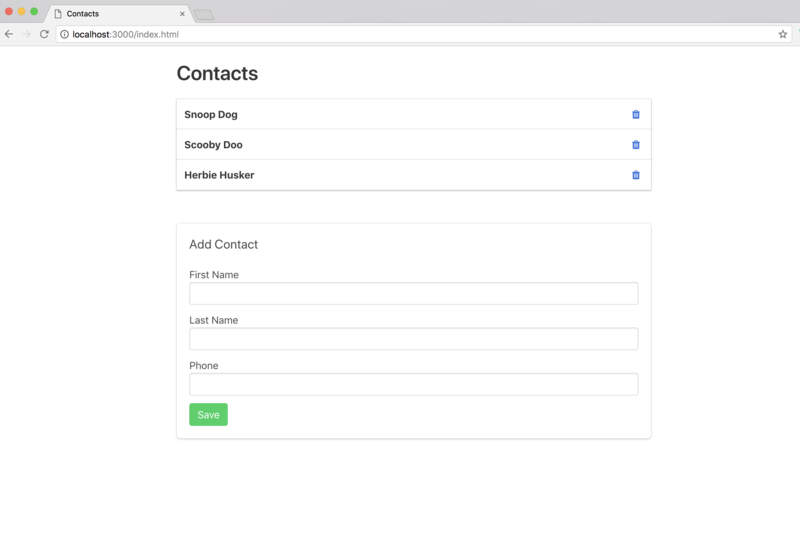 In doing so I provided a silly contacts list application that utilizes Node.js/Express.js for an application server along with a Vue.js based UI. Sequelize.js is a rather useful ORM that cuts away many of the details needed for database programming within Node.js-based applications and is quite popular among Node.js developers.